Maxstor is sole leading supplier of wide range of workstation and workbench manufacturer in India. We produce robust and rigid workstation and workbench supplier in India for all industries. 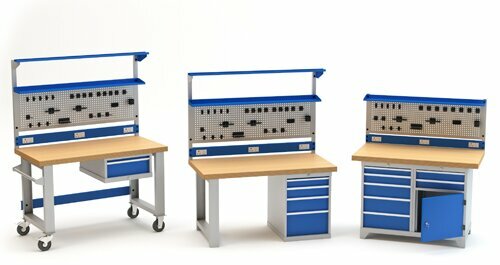 Our workbenches are adaptable and flexible which can be loaded with up to 1500 kg UDL. We have variants in workstation and workbench in India such as mobile workbench, portable workbench, drawer workbench, steel workbench, heavy duty workbench, industrial workbench, assembly workbench. Portable and mobile workbench are the workbench with wheels. Drawer workbench are the workbench with drawer which has multiple choice of drawer with partition and divider. Assembly workbench or assembly table is one and the same. It is widely used for light duty purpose which has roller tracks for sliding the bins. There are very rare professional in industrial table, worktable and assembly table manufacturer and suppliers in India. We also provide electrical workbench used in electrical industry, such are with ESD mat workbench and workstation. As we offer wide range options, each and every workbench and workstation can be essentially equipped in a space-saving method. It possible due to the high material quality as well as rigid welded joints which supports a heavy duty work which is everyday use in the workshop and production without any obstacles on workbench and workstations. Today there some new type of companies who changed production style and technologies for flexibility, ergonomics and efficiency. For such organisation we offer workstation and workbench in India which has all-in-one features for optimising manual workstations and work space. There are equipment to grab bins which possible the optimum and efficient working conditions for organisation of small working appliances. As exporter of workbench and workstation in India, we focus on every workbench and workstation design which has efficient enough for improvement and maximum output creation. We export workbench and workstation for production conditions such as high variant diversity and short product life cycles are important features which are considered in the production process for the workspace solution in order to eradicate waste and streamline processes. This workbench and workstation have efficient construction based and add-on table, which can be fitted on one side or on both sides. Such workbenches which has a configuration option to optimise assembly lines. Such workbench and workstation are widely used by different types of cargo, electrical industry, food packing industry which can solve virtually any transport problem. The different combinations of workbench tops, drawers, cladding options, vices and perforation panels can be arranged to create maximum working space and conditions, we always keep in mark to offer latest ergonomics. Workbench tops has effective protection against water, dirt, oil and grease and thus it is a stable working surface. Maxstor’s workbench and workstation offers slotted for the division with partitions adjustable shelf. Power supply option is also offered for workbench and workstation, 5 AMP and 15AMP for using power tools. Robust and rigid steel structure. Workbench with multiplex tops options such as 19 mm, 32 mm and 52 mm thick, Medium density fibre wood also available in 25mm and 50mm thick. Workbench legs made of 1.6 mm to 2.5 mm thick 80 x 30 mm rectangular channel with crossbars. Under table drawer cabinet available of 1.2 mm thick, with multiple options.